Kept primarily for their meat and eggs, chickens have graduated from simple farm birds to prized backyard companions. Chickens are fairly low maintenance, although they do require a sturdy pen to protect them and repel predators. Housing laying chickens require a little more attention than your ordinary backyard birds, but your efforts will be rewarded with a daily supply of fresh eggs. Contact your local civic authorities to ensure you can legally keep chickens on your property. 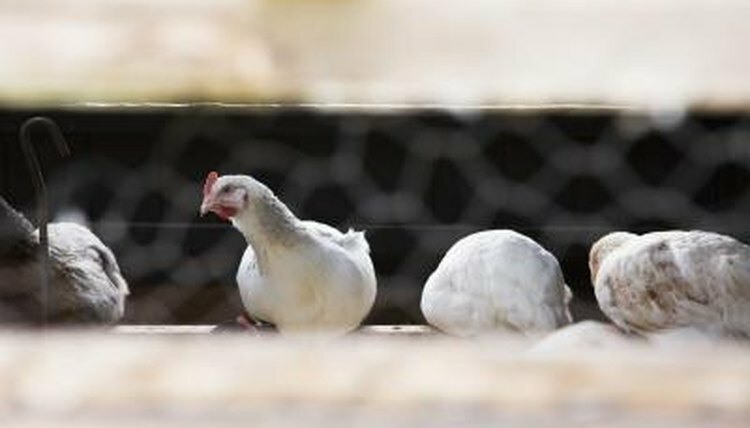 Many cities and counties have laws governing poultry, and you might need special permissions or a permit to keep laying hens. Determine the dimensions of your pen. A safe rule of thumb is that one laying chicken needs approximately 4 square feet of space, so multiply the number of chickens you want by four to determine the overall square footage of your pen. For example, a flock of 15 chickens needs 60 square feet of space, or a 10-foot-by-6-foot rectangular pen. Place a marking flag in the designated area to mark the starting corner of your pen. Measure the length of your first side in a straight line away from the starting corner, and place a flag to designate the second corner. Turn left 90 degrees and walk forward as you measure out the third side, placing a marker at the third corner. Make another 90 degree left turn and walk forward until you are even with the first flag to complete your rectangular pen outline. Mark this final corner with a marking flag. Hold the pointed end of a 6-foot metal T-post on the ground next to one of the marking flags, and push the post into the ground as far as possible with your hands. Hammer the post 2 feet into the ground, leaving 4 feet exposed to support the wire for your pen. Do the same with your remaining T-posts. Attach the free end of the chicken wire to the first post with zip ties, and unroll the wire toward the second post. Pull gently on the wire firmly as you unroll to prevent it from sagging, and zip-tie it securely to the second post. Move the roll around to the third pole, fastening the wire to the T-post. Unroll the wire spool as you walk to the last post, securing it tightly to the post. Pull the remaining wire across to the first post to complete the pen, and cut the wire even with the post. This side acts like a gate; pull it open to allow access to the pen. Close the gate by clipping one end of a double-ended snap at the top and bottom of the gate, and the remaining ends to the wire on the post. Set one 5-gallon bucket on its side in the pen for each chicken, and pad the bottom of the buckets with straw. Arrange the buckets side by side in a row and place a cinder block at each end to prevent the buckets from rolling.  If the weather turns rainy or cold, add an old dog house to the pen to privode extra protection from the elements.